Sainsbury’s, a supermarket chain in the UK, is running “The Greatest Gift”, an advertising campaign centred on a stop motion animation short film. The Sainsbury’s Greatest Gift commercial tells the story of Dave, a hard-working and devoted Dad, who realises that the greatest gift he can give people this Christmas is his time. As the first snow falls, we find our hero Dave caught up in the Christmas whirlwind. All he wants to do is to get home to spend time with his family, but all sorts of Christmas duties and calamities are getting in his way. That is until he sees a gingerbread man on his daughter’s bedside table that they’ve made to look like him. That gives him a genius brainwave. 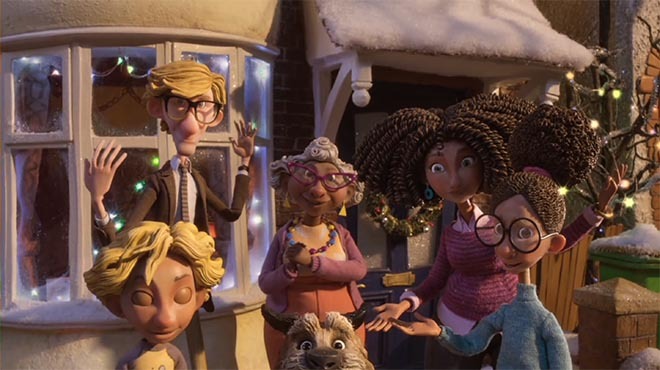 The Sainsbury’s Greatest Gift campaign, with the hashtag #ChristmasIsForSharing, includes a behind-the-scenes video, a follow-up animated film focused on festive foods, and an interactive option for making stop motion films at home. Gogglebox commentators provide their opinions on the two commercials, in a mixture of live action and stop motion animation. The Sainsbury’s Story Studio app makes it possible to create a stop-motion film using a smart phone. The Greatest Gift Film Kit is a mini stage set, with a range of sets, characters, props and storyboards. £2 from every kit goes to the Great Ormond Street Charity to help families be together over Christmas. Over 50% of children treated at Great Ormond Street Hospital are from outside of London. Sainsbury’s is raising money to fund accommodation that means patients’ families can stay close by in difficult times. The Sainsbury’s Greatest Gift campaign was developed at AMV BBDO by creative directors Toby Allen and Jim Hilson, copywriter Richard McGrann, art director Andy Clough, agency planner Craig Mawdsley, agency producers Rebecca Scharf, Trish Russell, Kate O’Mulloy and Nikki Holbrow, account team Leona McNally, Nikki Peddie, Aliya Brijnath, working with Sainsbury’s Head of broadcast communications Sarah Kilmartin. Media was handled at PHD by media planners Bucci Dive and Lucy Brown. Animation was produced at Passion Pictures by director Sam Fell, animators Andy Biddle, Gary Cureton, Jeff Newitt and Ange Palethorpe, executive producers Debbie Crosscup and Ryan Goodwin-Smith, producer Glen Holberton, head of production Mike Turoff, production manager Steven Riley, production assistant Paige Sullivan, head of CG Jason Nicholas, VFX supervisor Neil Riley, pipeline technical directors Sajjad Amjad and Javier Edo, character designers Margaux Zinser and Dan Lambert, concept artist Aurelian Predal, storyboard team Brendan Houghton and Tobias Schwarz, storyboard assist team Ange Palethorpe, Kim Burdon and Margaux Zinser, costume researcher Sally Cairney, animatic editor Tim Fulford, Kingsley Bailey and Tim King, coordinators Nia James and Jamie Moller, previous and face animators Chris Welsby, Wesley Coman, Paul Cousins, Catherine Elvidge, Cath Brooks, Daniel Gerhardt, Christian Jelen, Aldo Gagliardi and Brieuc Guénolé, CG character modellers Adam Burnett, Glen Southern, Florence Ciuccoli, Mattias Bjurstrom and Alex Huguet, CG environment modellers Ian Brown and Florent Rouseau, CG riggers Adam Burnett, Matteo Nibbi, Giulia Dell’Armi, and Victor Vinyals, texture and shading team Louise Chassain, Ellie Bond, Katreena Erin, Florian Magnin and Ian Brown, pre-comp artist David Mir, compositors David Lea, Sandra Roach, Johnny Still, Jazz Sagar and Alex Swann, editors Kingsley Bailey, Gus Herdman and Billy Mead, edit assistant Olivia Bohac. Puppets were produced at Mackinnon & Saunders. The set was created at Clockwork Frog by art director Andy Farago. 3D scanning was produced at Sample & Hold. 3D face printing was done at 3D Print Bureaux. Stop motion shots were produced at Malcolm Ryan Studios. Food shots were produced at Pulse Films by director Helen Downing and producer Lucy Kelley. Audio post production was done at Jungle Studios by Owen Griffiths. Music was composed by Bret McKenzie (Flight of the Conchords), arranged by Matt Dunkley and performed by James Corden (Late Late Show).